WWW, April 9 2017 - Just a few months after he was selected to be the next American president, Donald Trump proves once again how those that look at their preferential candidate as if he is the Messiah will turn out fooled. Yes, it happened. 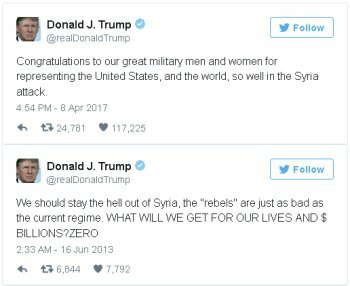 Donald Trump went to war in Syria, applauded by warmongers like John Mc Cain and Hillary Clinton. A big lesson to those that have put their trust in men by thinking they would basically elect the Messiah into the White House. Others went before them... Much more important is the fact that Trump's decision to is directly supporting the Muslim terrorists in their Islamic State and brings the world closer to WW3. A coalition of Russian, Syrian and Iranian forces have been dealing blow after blow to ISIS. They're heading to Raqqaa, the proclaimed capital of the Caliphate. How convenient or strategically was an attack with chemical weapons on a civilian population for the Islamists? As I heard it state: "Whenever ISIS need air support, they just have to drop chemical weapons". In the mean time, Russian president Vladimir Putin said he would strike back next time the USA will bomb Syrian airfields. After all, Russia and Syria are allies and the Syrian airfields are vital infrastructure in the fight against the Mohammedan Caliphate. Now, back to Trump's flip-flop. He was elected partly because he wanted to stay out of Syria. No more neo-conservative or neo-liberal if you will regime change games. No more backing up ISIS forces and other Islamists. All of this as opposed to Hillary Clinton, of whom everybody knows she is a hawk and wants to start wars wherever she can. 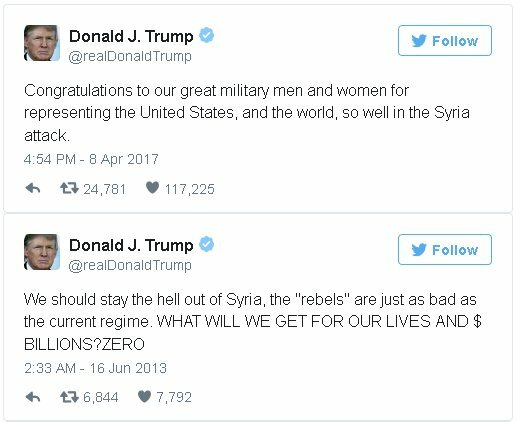 Trump vehemently opposed Obama's warmongering policies (Tweet left) and so do the people who voted for him. Well known radio talk show host Alex Jones, for example. He basically sold out completely to Trump and surely inspired many to vote for the guy with the funny hair. Now he's trying to find a way out. Others still "keep the faith". It is very interesting to see how Trump supporters now try to defend something they used to vote against. I've seen a comment by someone who said something to the effect of "Better that Trump start war, because I wouldn't want Hillary to do it". Yes, that is how blind people can follow a leader, trying to excuse him for doing the very same thing that he judged his predecessor for. Where this will all lead? We'll surely see it as things develop. In the meantime: let's keep in touch.